Kili and Truman love Christmas. They enjoy all the activity, decorations, attention, and treats. 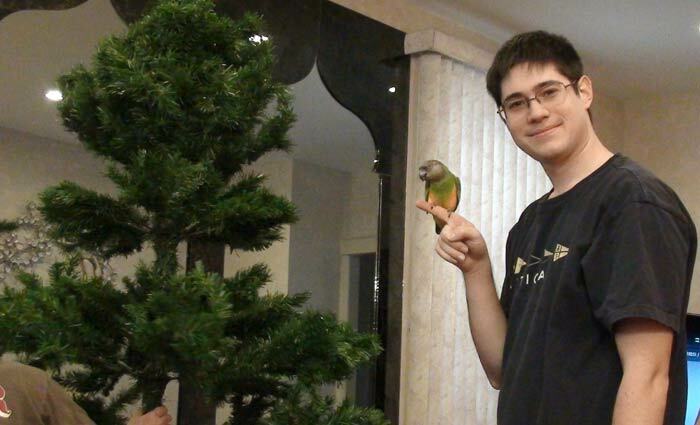 I had to help put up the Christmas tree over at my parent's house so I brought the parrot duo along with me. In the beginning they just watched from their carriers but eventually I started letting them out and closer. I brought a Parrot Training Perch along to give the birds a familiar place to fly to. They watched as my brother and I erected the artificial tree and sneezed endlessly from a year's worth of dust. I took Kili out first and showed her the beginnings of a tree coming together. Then I let her perch on her training stand at a distance to watch. Although a bit cautious, Kili was not scared of the new environment and activity. She was most happy sitting on the sidelines watching rather than being directly involved. On occasion Kili would fly back to me to be more involved or I would recall her over to help out. There was no trouble getting her to come as she was eager to see what was going on. Kili rode my shoulder while my brother and I strung out the colored lights onto the xmas tree. Truman watched from his travel cage, so none of it was a big surprise to him when I took him out and let him join us. One time he slipped off my shoulder and flew through several rooms and landed on the chair in the kitchen. I was happy to know he could find a safe landing place. Another time he flew off, went to another room, circled around, and came right back to me. He's a good flier and can think well on the fly. He did not knock anything over, poop anywhere, or do anything someone would fear a bird doing as a visitor in their home. Whenever the birds needed to poop, they went back to the training perch I had set up for them (with a newspaper below). While we put up fragile decorations, I put the birds back into their carriers for a break. After clean up, when the tree was finished, I took the parrots out one more time to see the transformation that had happened. They looked on in astonishment and just dreamed of how incredibly awesome it would be to chew every bit of it all into tiny shreds. I did a few more flight recalls with the birds and they had no fear of flying around the Christmas tree. They didn't fly into anything or cause any trouble. This is just one of many such social outings I take my parrots on. I want them to be exposed to as many different environments and situations possible while they are still young. Since they are flighted, every time they get to fly some place different, it builds their flight skills and makes the chances of recovering them if they get out better with every time. While the parrots were out, I took several precautions for their safety. I locked the doors and made sure there was no cooking going on in the kitchen. I put their carriers out in a place where they can see everything but also such that they could fly back to them while out. I brought a familiar Parrot Training Perch from home not only to provide a comfortable perching location but also a safe spot to fly back to if spooked. The birds got used to a new situation, had fun, and lightened my day through all the labors of holiday preparations. 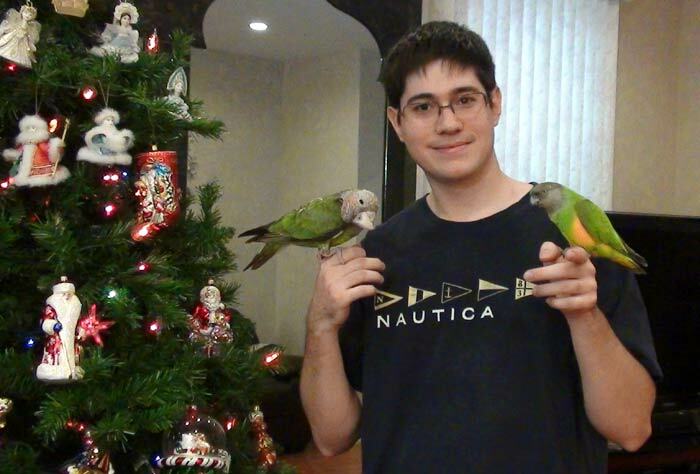 What are your parrots doing for the holidays? Leave a comment. I am spend a lot of effort socializing Truman to new people and environments. I try to take him with me everywhere I can, especially when driving. He can still get noisy in the car but with every drive, he's definitely becoming better behaved. This time I took him with me to the airport I fly gliders from. Even when I do bring the travel cage along, I still try to have Truman spend at least a few hours in the carrier to be more used to it. So I let Truman spend the ride out in his carrier. We waited a long time for him to get quiet in his carrier and rewarded him with a little bit of out of carrier time. Kathleen held him while I drove and let him look out the window. At the airport, Truman got to go in his travel cage which to him is a big reward. Not only is it more roomy than the carrier, it also has some of his favorite toys. Truman spent most of the day out on top of his travel cage or inside of it playing. I recalled him a few times and had Truman show his tricks to everyone. Both the car and office of the gliderport have many windows but Truman did not once try to fly through any of them. I usually go around and show him all the windows to get him better acquainted to them. But between the fact that he was too busy playing and not interested in flying anywhere, he stayed well away from any potentially dangerous glass. Just a day after completing assembly of the Kings Travel Cage that I bought for the parrots, I began introducing them to it. Actually I had already begun introducing them while my brother assembled it by having them sit on nearby perches and watch. When the birds see humans safely interacting with something, it gives them more confidence to try it themselves rather than be frightened by a newly appeared object they are expected to go into. 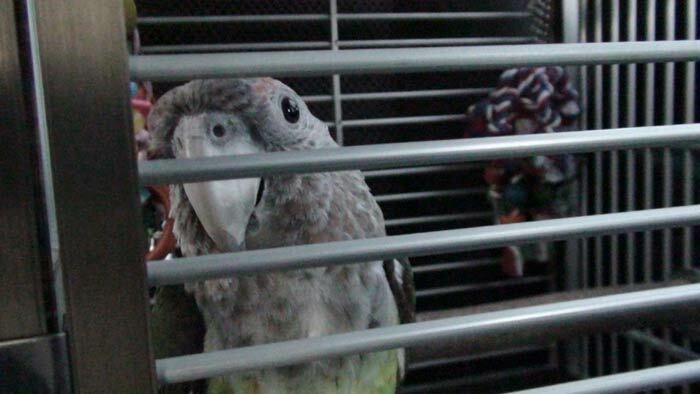 Don't just shove or force your parrot into the travel cage or carrier immediately. Ok, it's true that I did this with Truman the day I assembled it, but with good reason. The travel cage looks just like his big cage and he is young and ready to explore. So by putting him into it that way, it did not frighten him at all. He was more excited about checking out the toys. However, I would not have done the same with Kili or most other birds. Instead, use the following procedure. It is important to maintain the carrier/travel cage experience a positive one. The simple fact of getting locked up in it and ignored for some hours (quite likely bumpy and uncomfortable) is quite unpleasant in itself. This is why it is required to do everything in your power to make carrier time be as good as possible to make up for that. If you don't make carrier time enjoyable for your parrot, it will quickly become scared of going in the carrier and resist by all means. It will fly away, bite, and make it really hard for you to get it in there. Let me remind you that good carrier behavior is not only necessary for taking a parrot out on social outings, but also for emergency vet visits and grooming. Unfortunately, most people only end up using a carrier in time of need. This is likely to be rushed and unpleasant for the parrot. So for all of these reasons, I recommend carrier/travel cage training before you actually need to transport the parrot. I urge everyone who owns a carrier (whether your parrot is already accustomed to it or never been in it) to go and practice some carrier time with your parrot in a pleasant way as I will soon get to explaining, I promise. If you don't have a carrier, please go any buy one and practice these techniques because you can't be certain when you might need to take your parrot some place. While the first step to a successful carrier introduction is letting the parrot see it and see you working with it, next comes a more proactive approach. 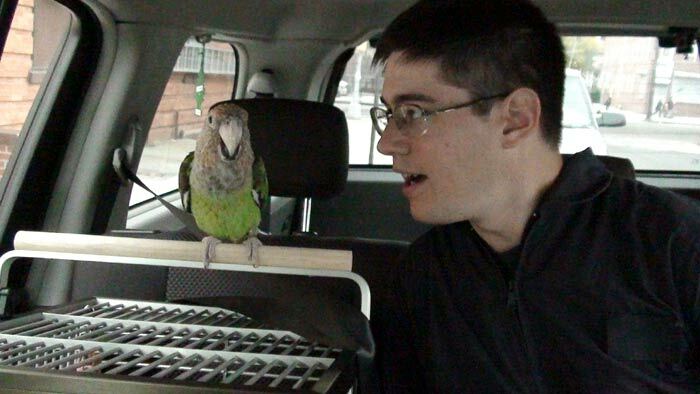 Don't just force your parrot into the carrier all at once. Instead, put it on top of, next to, or around the carrier/cage. I started by carrying Kili over and putting her on the cage top handle perch. She wasn't too scared because the dowel perch looked similar enough to other dowel perches she had previously frequented. But more importantly, she has a clear path to fly away should she choose to because I did not immediately confine her in the cage. To get Kili more used to being there, I targeted her back and forth on that perch. Then I targeted her down to the cage top bars. Meanwhile Truman was at a distance watching. Unexpectedly he flew over to join us. He wasn't going to miss out on all this fun. He landed on the cage top and wanted to play "target" too. So the birds took turns targeting to various spots on the cage top. I took Kili and brought her down to the cage level. I didn't make her go in but rather targeted her from my hand to the travel cage perch. She stepped right in and was thrilled to get a treat so effortlessly. I continued targeting her around inside until she noticed the new toys and went to check them out. It didn't take any targeting to get Truman to go into the travel cage. The sight of new toys just drew him right in. Getting him away from those toys would probably serve a greater challenge then getting him to go in. 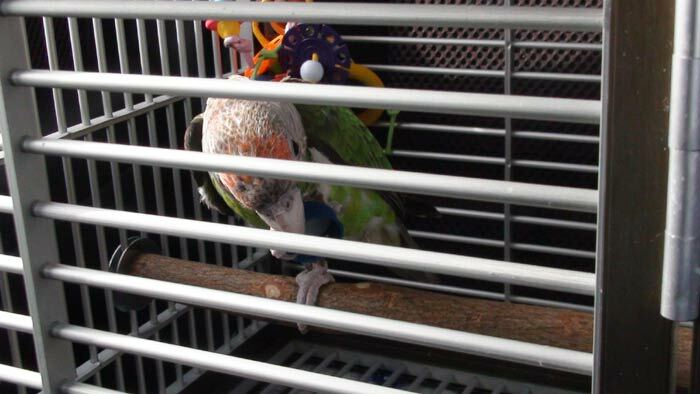 If your parrot loves toys, definitely use this to your advantage by providing better than usual toys in the travel cage to make it more worthwhile. It is very important that your parrots actually like their travel cage or carrier. Just tolerating isn't enough. They have to like it because it will serve as their home away from home. They need to feel safe and comfortable in their carrier. Furthermore, for flighted parrots it is good for them to be super familiar with their cage or carrier so that they have a place to fly back to if they get scared when you're out. One more reason I want my parrots to become super familiar and love their travel cage is in the event they ever get lost outside home, I will put the travel cage outside to lure them back in (I know people recommend putting the bird's cage outside but Truman's cage is not going to fit through the door, so travel cage works great). The travel cage familiarization was a great success, but how would the parrots react to being locked inside for periods at a time? I began with Truman by pouring a meal of pellets in the travel cage's food bowl and leaving him inside for an hour. Without hesitation Truman went right for the food and had an enjoyable meal. Once again, here is an example of providing a positive cage/carrier environment where something good happens every time the parrot is inside. For the next few days I let the parrots take turns eating their meals in the travel cage and being locked inside progressively longer to get used to being in it. I am very happy with the custom perch layout I configured. 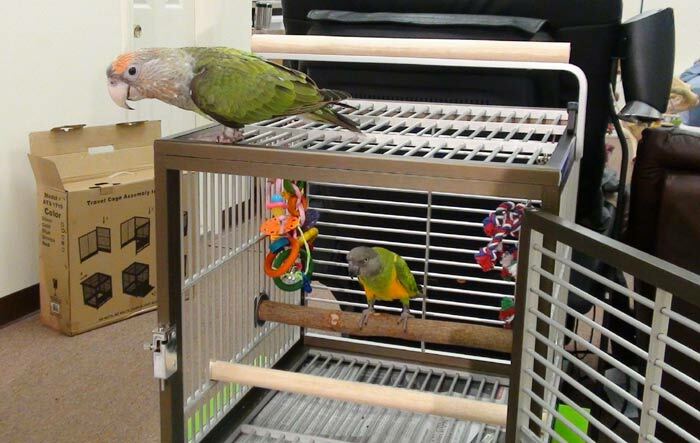 The perches came out to be at an ideal height and distance that either parrot can comfortably use the travel cage. Truman uses his beak to lean and step from perch to perch; Kili hops. 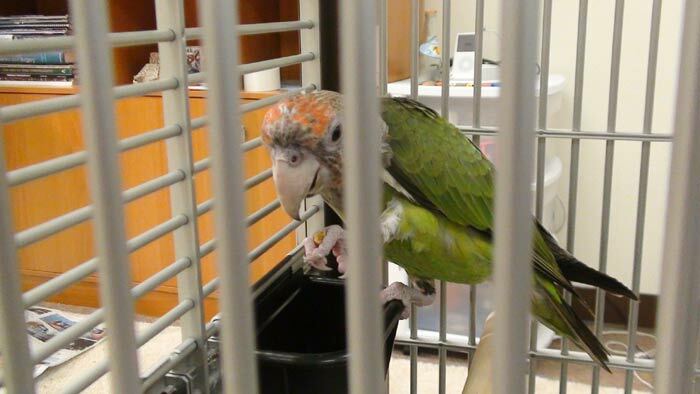 Although the parrots can easily climb the cage bars, they have little need to. Now that the birds were accustomed to being in the travel cage at home, it was time for a field test. The day I took Truman flying in an airplane, I brought him to the airport in his carrier, but I let him ride back home in his travel cage. He loved it. He was endlessly entertained by the toys hanging inside. He would make his way back and forth on the perch to play with the two toys. 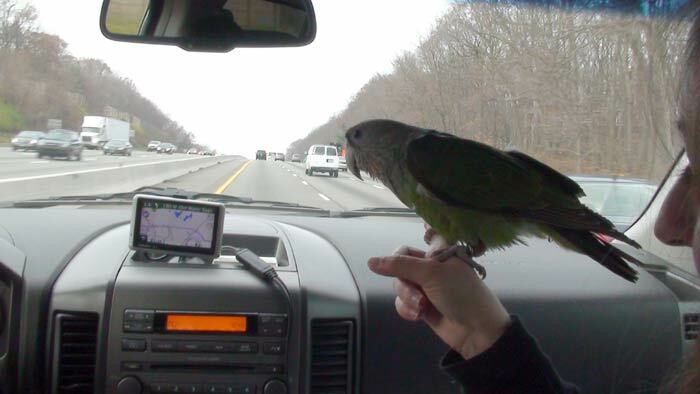 He held on well and never fell off his perch during the drive (even bumpy parts and steep turns). 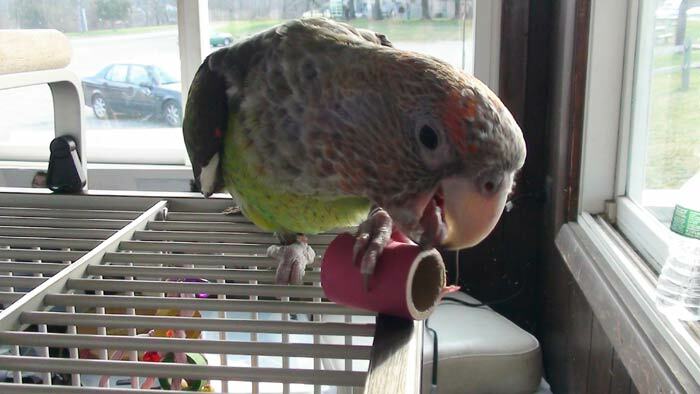 He was even able to balance on one foot while playing with a bottle cap in his beak and dominant foot. He was so busy playing the whole car ride that he did not scream or cause any trouble. Later that same day Kili got to spend some time and eat a meal in the travel cage while out as well. Both parrots did great in their travel cage and appear to like it better than their travel carriers. Truman didn't step in poop or his his tail on the sides. 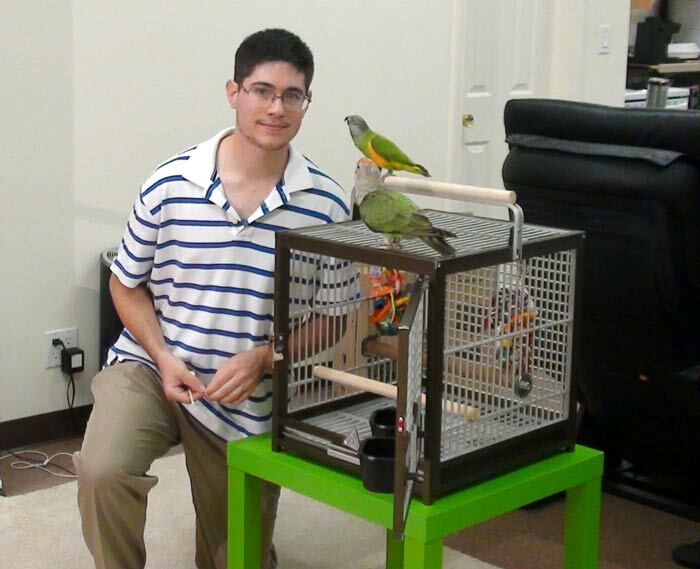 Although I found some faults in the set up, price, weight, and value of the travel cage, it was a major hit with the parrots. With the modifications I made and training I did, this travel cage is absolutely worthwhile for the parrots. From the bird's perspective, I definitely recommend this travel cage. Rather than being some unpleasant form of confinement, I had succeeded in introducing the travel cage as a fun place to be. 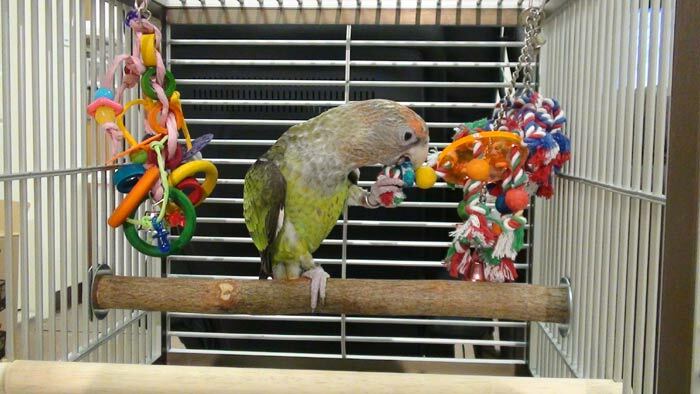 The parrots enjoyed eating and playing with toys in their new cage. They go in willingly and even fly over and land on top of the travel cage for the hell of it. 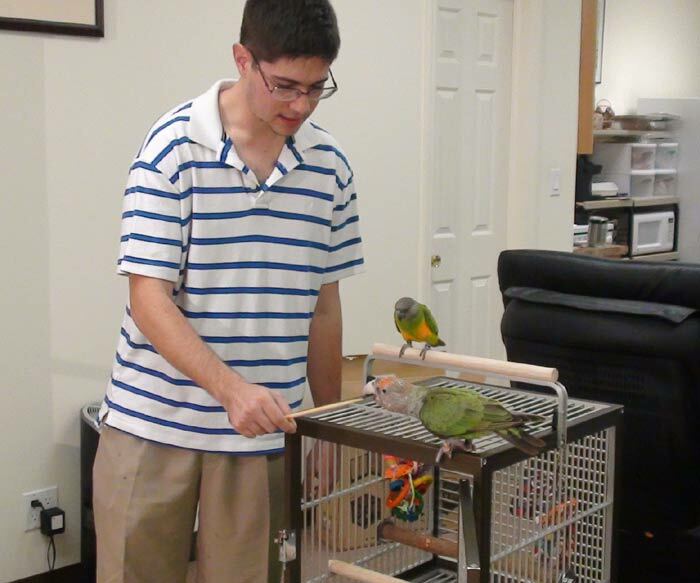 Regardless of what cage or carrier you use for your parrots, just remember to make it a worthwhile experience. 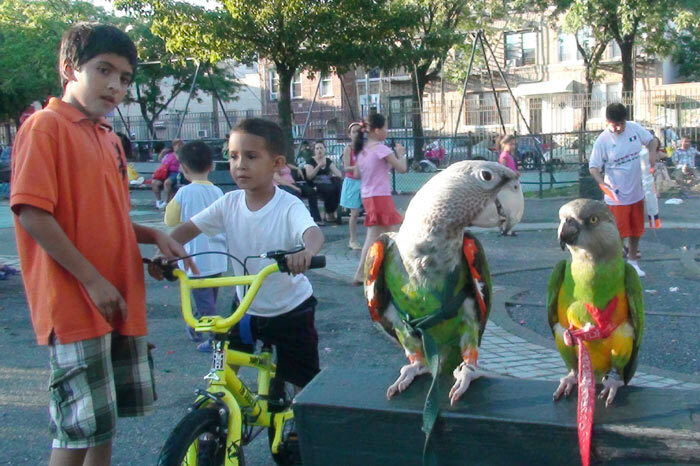 Good carrier training is the first step in being able to bring your parrots out for socializing to the rest of the world.